Last year, every congregation, member, and pastor in LCMC was invited by LCMC Service Coordinator Rev. Mark Vander Tuig to take part in our association's 5th Annual Three Days of Prayer. The event took place from January 3-5, 2017 and each day had its own theme. Day one was a day for confession, day two a day of petition, and day three a day for vision. Participants were able to structure each of the three days in any way that made sense for them. 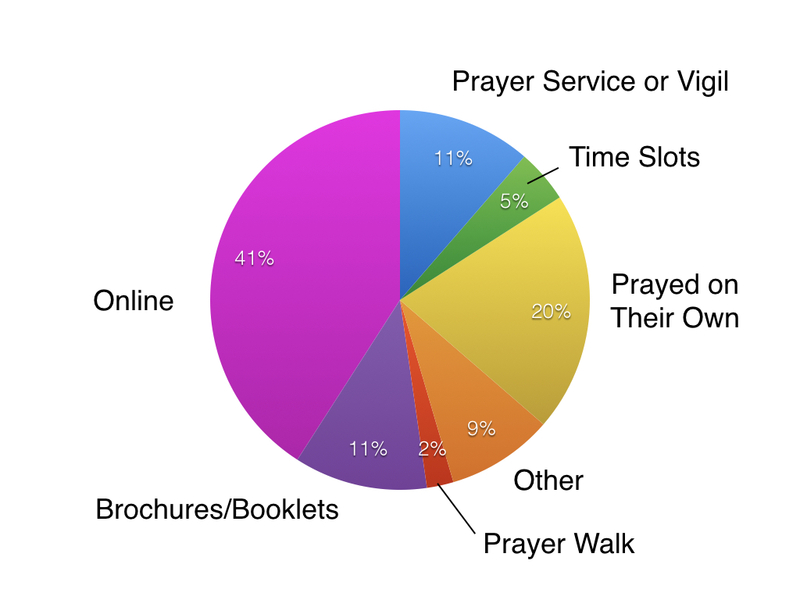 Based on the results of last month's Three Days of Prayer poll, 25% of this year's participants celebrated Three Days of Prayer for the first time. Approximately 17% reported that they had participated on their own in the past, but that 2017 was the first time their congregation had organized somethig together. While 20% of people reported praying on their own, 27% told us that their congregation had organized some type of special event this year. This year, a handful of congregations opted to organize a prayer service or other special event this year while also providing take-home resources to congregation members. In addition to offering printed and online resources, Resurrection Evangelical Lutheran Church of the Western Reserve in Stow, OH used the event as an opportunity to connect with other congregations in the area. "We partnered with a county-wide effort to hold a cross-cultural and cross-denominational event, Summit Ablaze, inviting people to eat with us before," said Laurel Bobb, the congregation's pastor. "We sent out a booklet to all members and frequent visitors that explained prayer and had an outline to follow for people who wanted to pray at home," said Julie Wood of Resurrection Lutheran Church of Alpena, MI. "We opened the church from 6:00 to 9:00 A.M. on each of the three days for people to come in and pray. We held a prayer service on Wednesday night that incorporated all the themes into one event." When asked if there was anything they would like to do differently for next year's Three Days of Prayer, most people agreed that they would like to start planning early and start promoting the event before the busy holiday season begins. One congregation told us that sending regular reminders, as well as mentioning Three Days of Prayer during regular church services, proved to be an effective way of getting the word out. "We talked about the event on the Sunday preceding [and] I sent a reminder email each of the three days. I used the event as a topic for a sermon on a Sunday following the event and we discussed God's vision for the church at large," said Pastor Jo Kinnard of Our Savior's Lutheran Church in Inwood, IA. "Our Savior's in Inwood is definitely a prayer warrior congregation! They loved the idea, and the reminders, and the opportunity to pray." Our next Three Days of Prayer event will take place January 2-4, 2018, so be sure to mark your calendars and start planning early! Kristy Thomas is a Halloween enthusiast with an affinity for 90s music and depression glass. When she needs to unwind (which is pretty much all of the time), she likes arts & crafts, staying active, and playing the ukulele. As Communications & Public Relations Specialist, she is responsible for keeping the people of LCMC informed of what’s going on within the association and for tackling all of the creative-type projects. For the future, she would like to see the congregations of LCMC be proactive in raising up future leaders and for the “20-30 somethings” to be able to make some cool things happen, both within The Church and throughout the world.